The gene desert on human chromosomal band 8q24 harbors multiple genetic variants associated with common cancers, including breast cancer. The locus, including the gene desert and its flanking genes, MYC, PVT1 and FAM84B, is also frequently amplified in human breast cancer. We generated a megadeletion (MD) mouse model lacking 430-Kb of sequence orthologous to the breast cancer-associated region in the gene desert. The goals were to examine the effect of the deletion on mammary cancer development and on transcript level regulation of the candidate genes within the locus. The MD allele was engineered using the MICER system in embryonic stem cells and bred onto 3 well-characterized transgenic models for breast cancer, namely MMTV-PyVT, MMTV-neu and C3(1)-TAg. Mammary tumor growth, latency, multiplicity and metastasis were compared between homozygous MD and wild type mice carrying the transgenes. A reciprocal mammary gland transplantation assay was conducted to distinguish mammary cell-autonomous from non-mammary cell-autonomous anti-cancer effects. Gene expression analysis was done using quantitative real-time PCR. Chromatin interactions were evaluated by 3C. Gene-specific patient outcome data were analysed using the METABRIC and TCGA data sets through the cBioPortal website. Mice homozygous for the MD allele are viable, fertile, lactate sufficiently to nourish their pups, but maintain a 10% lower body weight mainly due to decreased adiposity. The deletion interferes with mammary tumorigenesis in mouse models for luminal and basal breast cancer. In the MMTV-PyVT model the mammary cancer-reducing effects of the allele are mammary cell-autonomous. We found organ-specific effects on transcript level regulation, with Myc and Fam84b being downregulated in mammary gland, prostate and mammary tumor samples. Through analysis using the METABRIC and TCGA datasets, we provide evidence that MYC and FAM84B are frequently co-amplified in breast cancer, but in contrast with MYC, FAM84B is frequently overexpressed in the luminal subtype, whereas MYC activity affect basal breast cancer outcomes. Deletion of a breast cancer-associated non-protein coding region affects mammary cancer development in 3 transgenic mouse models. We propose Myc as a candidate susceptibility gene, regulated by the gene desert locus, and a potential role for Fam84b in modifying breast cancer development. Mammalian genomes harbor large sequence regions (> 500-Kb) devoid of known protein-coding genes [1, 2]. Such sequences are widely known as ‘gene deserts’. Gene deserts encompass numerous gene regulatory elements, such as enhancers, and non-protein coding transcripts. Genome-Wide Association Studies (GWAS) over the last decade showed that gene deserts frequently harbor genetic variants associated with human complex traits, including breast cancer susceptibility. The gene desert located on human chromosomal band 8q24 is exemplary in that it contains multiple cancer-associated variants identified by GWAS, including 2 breast cancer-associated variants [3–5]. A recent fine-mapping study identified an additional independent association signal within the gene desert . All 3 variants are common in the human population with risk allele frequencies of 0.41, 0.58, and 0.56, for rs13281615, rs1562430 (rs78152450), and rs35961416 respectively [3, 4, 6]. Variant rs13281615 is more strongly associated with the development of estrogen receptor (ER) positive (ER+) breast cancer as compared with ER negative (ER-) breast cancer [7, 8]. All polymorphisms strongly correlated to the tag Single Nucleotide Polymorphisms (SNPs) are located within non-protein coding sequences (the gene desert), suggesting their involvement in long-range gene regulation. The genes located adjacent to the gene desert, MYC and PVT1 at one side and FAM84B at the other side, are candidates to play a role in 8q24 variant-mediated breast cancer susceptibility. MYC is well-known as a proto-oncogene that encodes a transcription factor involved in many cellular processes such as cell growth, apoptosis, differentiation and protein translation . PVT1 is a long non-coding RNA (lncRNA) gene, but also produces at least 4 distinct microRNAs (miRNAs) . The functions of these lncRNA transcripts and miRNAs are unknown. FAM84B (also known as BCMP101) has been implicated in breast cancer, as it was found in a proteomic analysis of cell membrane-associated proteins highly expressed in breast cancer . The gene desert region also sires multiple lncRNAs, including PNRCR1, CCAT1 and POU5F1B . Although several of these lncRNAs have been shown to be involved in prostate or colorectal cancer susceptibility [13–15], none have been implicated in breast cancer thus far, reducing their candidacy potential. Chromosome conformation capture (3C)-based studies have identified higher-order chromatin structures connecting MYC and PVT1 to the breast cancer-associated 8q24 gene desert region [16, 17]. Association of MYC, PVT1, or FAM84B transcript levels with any of the breast cancer risk alleles has not been reported. Global eQTL analysis on the The Cancer Genome Atlas (TCGA) data set for breast cancer did reveal numerous other transcripts associated with the rs418269 (in strong linkage disequilibrium with rs13281615) risk allele . These transcripts were enriched with MYC binding motifs, suggesting that in breast tumors the risk allele (partially) acts through MYC regulation. 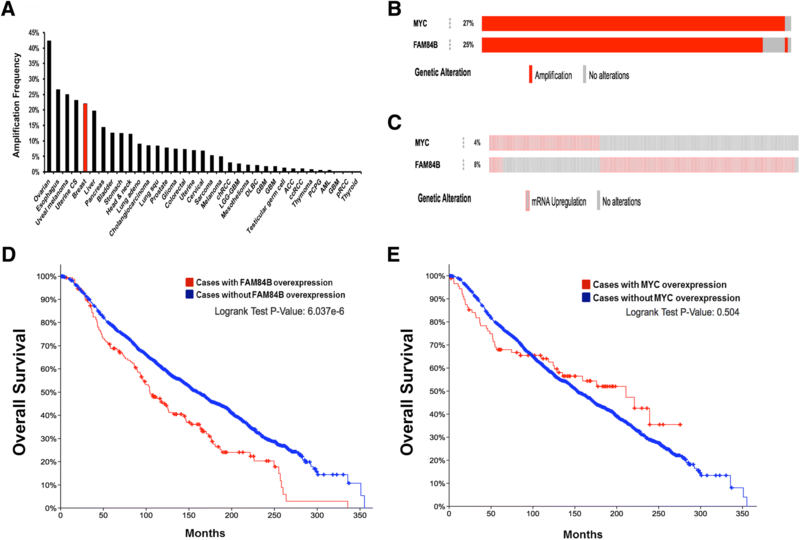 In human primary colon, prostate and breast tumor tissue MYC transcript levels do not associate with the presence of the risk allele [19–22]. To show causal effects of this non-protein coding locus on gene expression and specific aspects of breast cancer etiology, a mammalian genetic model organism is essential. The gene desert distal to MYC is considered orthologous between human and mouse, because (1) the flanking genes MYC, PVT1 and FAM84B are conserved, (2) the total genomic range between Myc on one end of the gene desert and FAM84B on the other end is similar (1.2-Mb) in both species, (3) the non-coding region shows strong evolutionary sequence conservation between the 2 species, and (4) the presence of DNAseI Hypersensitivity (DNAseI HS) sites in the human ortholog and ORegAnno sites in the mouse ortholog is indicative of putative gene regulatory sequences in both species (Fig. 1). Recently, Dave et al. published an analysis of a deletion mouse model lacking a 538-Kb region extending from the Myc gene promoter into the gene desert  (Fig. 1). This mouse model shows 50–80% downregulation of Myc expression and reduced development of several forms of cancer, including carcinogen-induced mammary tumorigenesis. While this study is of interest to link Myc downregulation to reduced cancer development, it does not specifically test the conserved breast cancer-associated region located in the middle of the gene desert proximal from MYC. We hypothesized that deletion of the conserved non-protein coding breast cancer-associated genomic region affects breast cancer development through regulation of candidate causal genes. We generated the MD allele resulting in deletion of approximately 430-Kb of sequence that encompasses all 3 regions orthologous to the breast cancer-associated variants in the 8q24 gene desert (Fig. 1). Our MD allele is different from the 538-Kb deletion described by Dave et al. in that it we deleted a gene desert region over 200-Kb proximal to the Myc gene promoter (Fig. 1). The primary goal of the study was to test the effect of the deletion on mammary cancer development, by introducing the allele into well-characterized murine transgenic models for luminal, HER2+ and basal human breast cancer. The secondary goal was to identify candidate regulated genes, as the non-coding locus has been implicated in gene regulation. We determined the transcript levels of human-mouse conserved genes directly flanking the gene desert, namely Myc, Pvt1 and Fam84b, as well as two other genes, Trib1 and Fam49b, located on the same chromosomal band (8q24 in human, 15qD1 in mouse) in RNA samples extracted from whole mammary gland, mammary tumors, prostate (all lobes combined), colon, bladder, spleen, and thymus tissue. These tissues were chosen, because variants associated with breast, prostate and colorectal cancer, as well as Chronic Lymphoblastic Leukemia (CLL), are located within the human ortholog of the deletion interval and one variant associated with urothelial/bladder cancer is located just outside of the deleted interval. The gene-specific expression studies highlighted MYC and FAM84B as strong candidate genes to be involved. MYC amplification has been previously implicated in breast cancer . FAM84B amplification is a frequent event in esophageal squamous cell carcinoma . How amplification and overexpression of the 2 genes relate to each other and to breast cancer outcomes is currently unknown. Analysis of publically available Molecular Taxonomy of Breast Cancer International Consortium (METABRIC) and TCGA data implies that FAM84B has effects on breast cancer that may be independent of MYC. All mice are maintained in AAALAC-approved facilities at UW-Madison and MUSC. The protocol was approved by the Institutional Animal Care and Use Committee of the University of Wisconsin-Madison and of the Medical University of South Carolina. To minimize pain and distress, analgesics, anaesthesia and euthanasia were applied where indicated. None of the procedures described below resulted in unexpected death. Euthanasia was performed using carbon dioxide asphyxiation and cervical dislocation unless stated otherwise. Generation of the MD mouse model was done using Mutagenic Insertion and Chromosome Engineering Resource (MICER) clone-assisted recombineering in embryonic stem (ES)-cells (AB2.2 from strain 129/SvEv)  as previously described . Proper integration of the 2 clones was verified by Southern blot analysis (Additional file 1: Figure S1). Hypoxanthine/aminopterin/thymidine (HAT)-resistant, karyotypically normal ES-cell clones were monodispersed and microinjected into C57Bl/6 blastocysts to produce chimeric founders. After germ line establishment, the MD allele was introgressed onto the FVB/N genetic background for > 10 generations. All experiments were done on the FVB genetic background. MD carriers were intercrossed to generate homozygosity for the MD allele (MD−/−) or wildtype allele (MD+/+). Females and males were subjected to weight measurements. 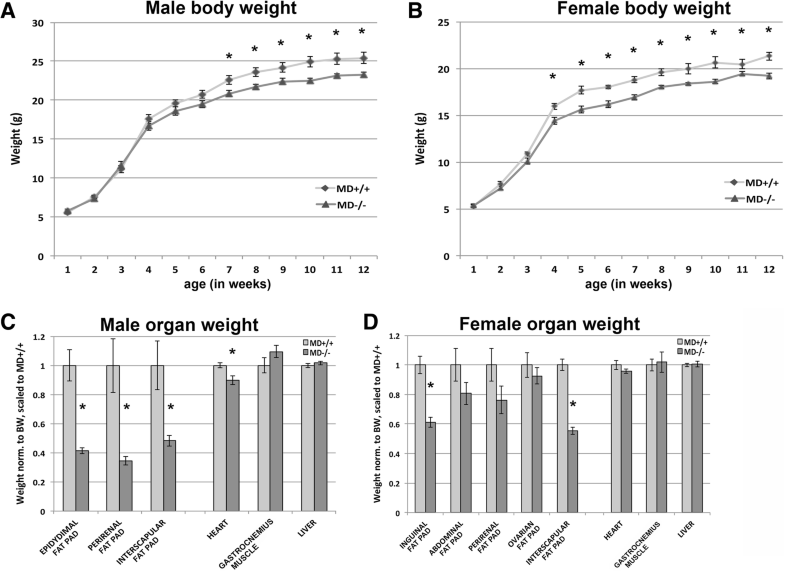 Organ weights were determined at necropsy (12 wks) and normalized to total bodyweight. Litter sizes were also recorded. Three well-characterized mouse models for human breast cancer were purchased (Jackson Labs), namely MMTV-PyVT (Polyoma Virus Middle-T antigen) , MMTV-neu (HER2neu oncogene)  and the C3(1)-TAg (C3(1)-Simian Virus 40 T antigen) , all existing on the FVB genetic background. MD−/− or MD+/+ mice were intercrossed with MMTV-PyVT, MMTV-neu or C3(1)-TAg to generate groups of carriers having no copies (Transgene;MD+/+), 1 copy (Transgene;MD+/−) or 2 copies (Transgene;MD−/−) of the MD allele. Latency to first palpable tumor, tumor growth (using digital caliper), overall survival, tumor multiplicity at necropsy and lung metastasis were recorded. For all models, the original FVB/NJ background and our FVB (containing 129/AJ) background (MD+/+), showed no difference in any tumor parameter measured (Additional file 1: Figure S2). Therefore, these subgroups were combined into one MMTV-PyVT;MD+/+, MMTV-neu;MD+/+ or C3(1)-TAg;MD+/+ group to compare against their respective MD−/− groups. Tumor-bearing mice were inspected twice weekly and measurements were recorded. In addition to inspection during tumor measurements, health monitoring was done at least once weekly by the veterinary care staff of the Division of Laboratory Animal Research at MUSC. Mice were euthanized when a tumor reached 2 cm in diameter or at humane endpoint when the mice show severe signs of distress, indicated by ulceration of a tumor, severe weight loss, abnormal reduced responsiveness to external stimuli, possibly in combination with hunched posture. Tumor-bearing MMTV-PyVT and MMTV-neu mice were anesthetized using isoflurane and subjected to intracardiac perfusion with saline to drain the blood and blanch the lungs. Following euthanasia by thoractomy, a round gavage needle was inserted into the trachea to inflate the lungs with Amsterdam fixative. The lungs placed into 70% ethanol and visually inspected to quantify macroscopic metastatic foci present on all lobes. For histological analysis, lungs were removed from 70% ethanol, fixed in 4% paraformaldehyde for 48 h. Paraffin-embedded lung tissue was sectioned and stained with Hematoxylin and Eosin to visualize microscopic lung metastasis. Five sections taken at 50-μm intervals were quantified and averaged to calculate metastasis for each animal. Under isoflurane anesthesia, the fat pads of MD+/+ and MD−/− recipients (21–28 days) were cleared by removing the growing mammary tree of both inguinal glands. Proper removal of host mammary tree was checked by whole mount analysis. Premalignant inguinal mammary glands from MMTV-PyVT;MD+/+ or MMTV-PyVT;MD−/− donors (28–35 days) were harvested, finely minced and grafted into both cleared recipient (MD+/+ or MD−/−) fat pads. Analgesics were given post-surgery for 2 days. Palpation of the graft sites began 4 weeks after surgery and occurred twice weekly. At humane end point, tumor end point or at 40 weeks after surgery, the transplant sites without tumors were whole mounted to examine graft rejection. Graft rejection was not detected in the MMTV-PyVT;MD+/+ donor groups, since whole mounts for transplant sites without a palpable tumor showed hyperplastic tissue and smaller tumor nodules. For the MMTV-PyVT;MD−/− donor groups, 3 out of 14 (MD+/+ recipient) and 2 out of 14 (MD−/− recipient) had at least 1 graft site rejected. Only mice without graft rejection were included in the analysis. Latency and lung metastasis were recorded as described above. From MMTV-PyVT;MD+/+ and MMTV-PyVT;MD−/− females at 4–5 weeks of age, and C3(1)-TAg;MD+/+ and C3(1)-TAg;MD−/− at 6 months of age, inguinal and thoracic mammary glands were removed, placed on slides and manipulated using blunt tweezers to thinly spread the fat pad. The whole mounted glands were then fixed and stained using standard Carmine Alum staining. Briefly, the slides were placed in 70% ethanol overnight, followed by an hour fixation in a solution containing 1 part glacial acetic acid and 3 parts 100% ethanol. Subsequently, the slides were washed in 70% ethanol, 50% ethanol and dH2O, for 15 min., 5 min. and 5 min., respectively. Then, the slides were stained in alum carmine solution (2.5 g alum potassium sulfate, 1.0 g carmine boiled in 500 ml dH2O) overnight, followed by washes in 70% ethanol, 95% ethanol and 100% ethanol, for 15 min. Each. Finally, the slides were de-stained in xylene until the mammary ductal structures are clearly visible. The stained whole mounts were photographed. Tissue samples were flash frozen in liquid nitrogen and stored at − 80 °C until further use. Frozen tissue samples were quickly homogenized in Tri-Reagent and total RNA was extracted using a total RNA extraction kit (Ambion) or chloroform-based extraction method. Following extraction, the RNA was DNAseI treated and visually inspected for DNA contamination and RNA degradation on an agarose gel. Total RNA (800 ng) was used as input in the reverse transcriptase reaction using the SSII system (Life technologies). QPCR was done using TaqMan assays (Life technologies), or using SYBR green assays with pre-tested primer sets (Integrated DNA Technologies; listed in Additional file 2: Table S1. TaqMan assay detection was done on a 9700 GeneAmp PCR system (Applied Biosystems) and SYBR detection was done on a Light Cycler 480 (Roche). The MD−/− and MD+/+ samples to be compared were always treated the same way and included in the same QPCR plate. Each measurement was done in triplicate. Only replicates within 1.0 Ct were retained and averaged to represent the sample value. Gene specific transcript levels were normalized by the 18S RNA level that served as an internal control. Templates were prepared from isolated mammary epithelial cells from 6 MD+/+ mice, as previously described . The restriction enzyme of choice was BglII. The fixed primer was chosen to be located in the Myc promoter. The experimental primers were chosen to be located within the deleted interval, biased towards regions of evolutionary sequence conservation. The relative interaction frequency for each experimental primer in combination with the fixed primer was determined for each sample as the average of at least 3 replicate measurements divided by the average of a Bacterial Artificial Chromosome (BAC)-based positive control template . Primers and BACs are listed in Additional file 2: Table S1. The cBioPortal for Cancer Genomics was used to visualize and analyze the effect of MYC and FAM84B amplification and overexpression on breast cancer patient outcomes [32, 33]. Within the portal the METABRIC (2509 cases) or TCGA provisional (1105 cases) were selected. The data were queried using MYC and FAM84B as gene identifiers. Default settings were used to identify cases in which MYC or FAM84B were copy number amplified. To identify cases in which MYC or FAM84B were overexpressed, data were queried using an expression cutoff of greater than 2 standard deviations above the mean. Means of continuous variables were compared using two-sample t-tests or multifactorial ANOVA. Two-sided alpha level of 0.05 was used for determining statistical significance. Sample sizes are provided in figure captions. Survival curves on METABRIC and TCGA data were created using the built-in Kaplan-Meier Estimator and compared using the built-in log-rank tests. The MICER clones for Cre-lox recombination in the ES cells were chosen to be located such that the deletion interval encompassed the mouse ortholog of the human region containing the breast cancer-associated and correlated variants (Fig. 1). The end of the resulting deletion interval is located approximately 200-Kb proximal to the Myc gene (Fig. 1). The human ortholog of the deleted sequence (dashed lines in Fig. 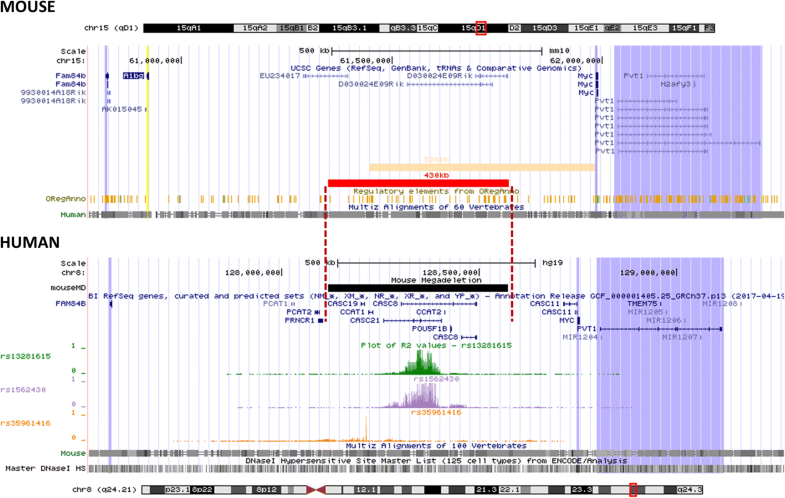 1, as determined by the Liftover function built in the UCSC Genome Browser) contains many DNAseI HS sites, indicative of putative gene regulatory sequences (Fig. 1), including those involved in the higher-order chromatin structures mentioned in the Introduction. In the mouse the deleted interval also contains many putative gene regulatory elements marked by ORegAnno track (Fig. 1). Mice homozygous for the MD allele are viable. Litter sizes were not significantly different between breedings with MD−/− and MD+/+, indicating that viability and fertility were not affected (Additional file 1: Figure S1). The weights of female and male pups before weaning did not significantly differ between MD−/− and MD+/+ genotypes, indicating that lactation was not compromised. After weaning, the weights of both sexes of the MD−/− mice started to deviate from those of the MD+/+ mice resulting in a ~ 10% difference at 12 weeks (Fig. 2a, b). To trace the origin of this difference, we performed gross dissection of males and females at 12 weeks and weighed various fat pads and organs. The normalized (to total body weight) heart, liver and gastrocnemius muscle weight was not significantly different or showed no more than 10% difference between MD−/− and MD+/+ animals (Fig. 2c, d). In contrast, the normalized weights of the (inguinal) mammary and interscapular, fat pads were over 20% lower in MD−/− females than in MD+/+ females. The normalized weights of the abdominal, perirenal, and ovarian fat pads were lower, but did not reach statistical significance, suggesting potential compensatory mechanisms controlling for the sizes of those fat pads in the MD−/− female mice. In the males, the normalized weights of the epidydimal, perirenal and interscapular fat pads were over 50% lower in MD−/− than in MD+/+ mice (Fig. 2c, d). These data demonstrate that the deletion results in lower total body weight with adipose tissue disproportionally affected. We crossed the allele onto 3 transgenic mouse breast cancer models, namely MMTV-PyVT, MMTV-neu and C3(1)-TAg. These models were chosen to represent 3 major subtypes of human breast cancer. The majority of MMTV-PyVT-induced tumors have been classified histologically and by their global gene expression profiles as luminal mammary tumors [34–36]. MMTV-neu-induced tumors represent mammary tumors of the HER2+ luminal subtype, and C3(1)-TAg-induced tumors represent tumors of the basal subtype of human breast cancer [34, 36]. The MMTV-PyVT and MMTV-neu models are also widely known as models for metastatic progression. The mean latency to the first palpable tumor for MMTV-PyVT;MD+/+ was 7–8 weeks of age. MMTV-PyVT;MD+/− and MMTV-PyVT;MD−/− mice showed a significantly different disease-free survival curve (Fig. 3a). In MMTV-PyVT;MD−/− the mean latency was shifted to 13 weeks of age and in MMTV-PyVT;MD+/− to 9–10 weeks of age (Fig. 3b). MMTV-PyVT;MD−/− animals had a lower multiplicity at necropsy when compared to MMTV-PyVT;MD+/− and MMTV-PyVT;MD+/+ animals (Fig. 3c). 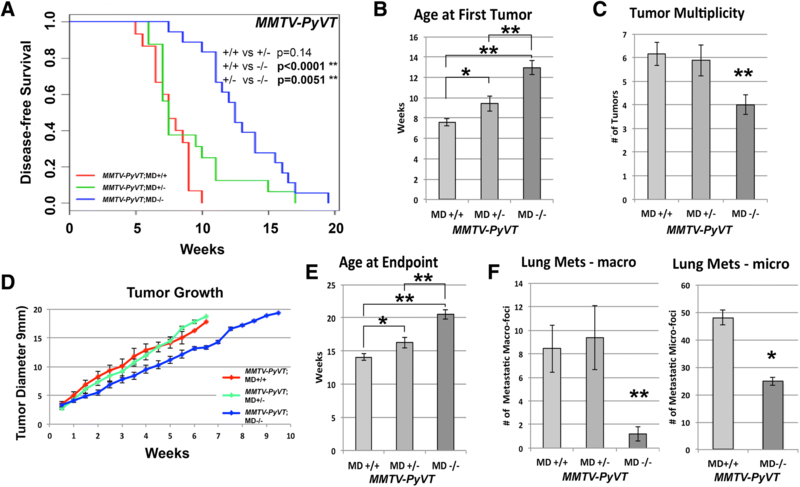 The tumor growth curves reveal a tumor growth-reducing effect of MMTV-PyVT;MD−/−, but not MMTV-PyVT;MD+/−, as compared with MMTV-PyVT;MD+/+ (Fig. 3d). 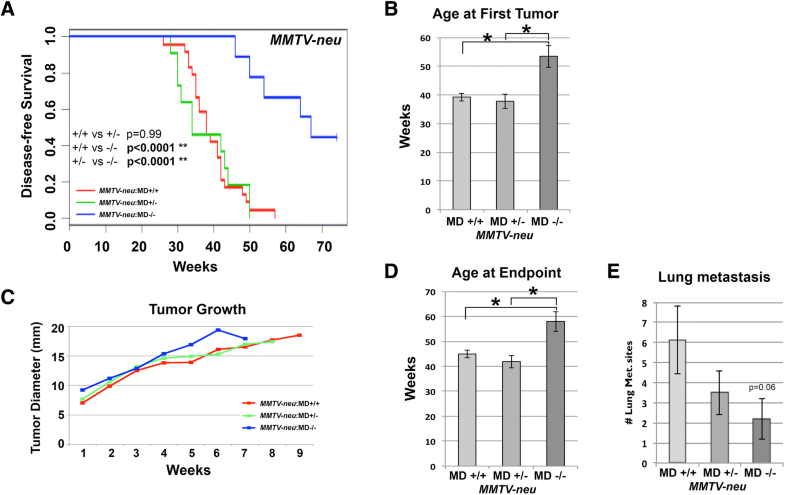 Increased latency and reduced tumor growth rate in the MMTV-PyVT;MD−/− animals resulted in increased overall survival (Fig. 3e). Despite the fact that age at necropsy was higher in the MMTV-PyVT;MD−/− animals than in the MMTV-PyVT;MD+/− and MMTV-PyVT;MD+/+ animals (allowing for more time to metastasize and grow), MMTV-PyVT;MD−/− animals have a ~ 4-fold reduced multiplicity of macro-metastatic foci than MMTV-PyVT;MD+/− and MMTV-PyVT;MD+/+ animals (Fig. 3f). Micro-metastatic foci multiplicity was also reduced (Fig. 3f), but less pronounced. The MMTV-neu carriers were palpated weekly starting at 16 weeks of age. Disease-free survival curves showed that MMTV-neu;MD−/− has a strong delay in tumorigenesis (Fig. 4a). Almost half of the mice were still tumor-free at 72 weeks of age. 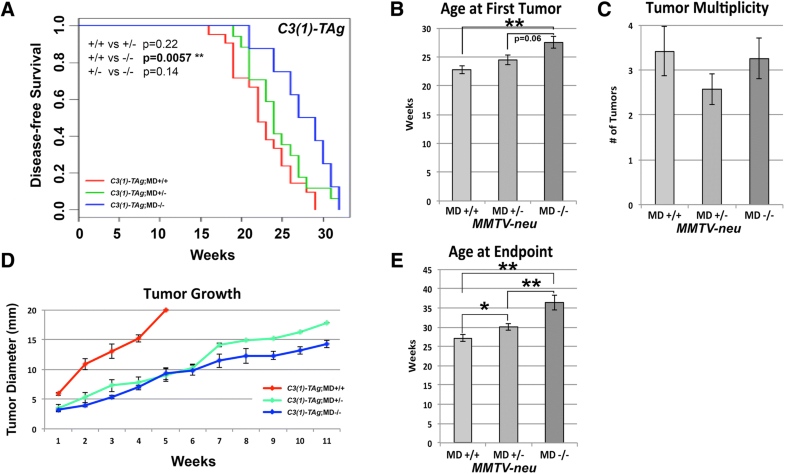 For the animals that did develop a tumor, latency was increased from 40 weeks of age for the MMTV-neu;MD+/+ group to 53 weeks of age for the MMTV-neu;MD−/− group (Fig. 4b). Since most mice developed only 1 tumor, multiplicity was not assessed. Tumor growth was not affected (Fig. 4c), which resulted in almost identical graphs for the average age at endpoint as for age at first tumor (Fig. 4d). In accordance with the MMTV-PyVT model, lung macro-metastatic foci multiplicity was also lower in MMTV-neu;MD−/− compared to MMTV-neu;MD+/+ (p = 0.06; Fig. 4e). The C3(1)-TAg carriers were palpated weekly starting at 12 weeks of age. Disease-free survival curves indicated that C3(1)-TAg;MD−/− mice show increased latency for C3(1)-TAg-induced tumorigenesis compared with C3(1)-TAg;MD+/+ mice (Fig. 5a). C3(1)-TAg;MD+/− mice were not different in disease-free survival from C3(1)-TAg;MD+/+ mice, but showed a strong non-significant trend (p = 0.06) to having decreased latency when compared with C3(1)-TAg;MD−/− (Fig. 5b). We did not observe an effect on tumor multiplicity in the C3(1)-TAg model (Fig. 5c). The tumor growth rate was affected by the MD allele in both heterozygous and homozygous state (Fig. 5d), which increased overall survival, as compared with C3(1)-TAg;MD+/+ (Fig. 5e). Metastasis incidence in this model is too low to be assessed. We examined premalignant mammary glands by whole mount analysis in the MMTV-PyVT and C3(1)-TAg models at 4–6 weeks and 6 months of age, respectively. The protective effect of the MD allele on MMTV-PyVT -induced tumorigenesis is well visible at 46 days of age, since the MMTV-PyVT;MD+/+ glands show multifocal, dense hyperplasia, whereas the MMTV-PyVT;MD−/− glands show less advanced, more localized hyperplasia at that age (Additional file 1: Figure S3). A significantly lower amount of macroscopic hyperplastic nodules is observed in MMTV-PyVT;MD−/− mice as compared with MMTV-PyVT;MD+/+ mice (Additional file 1: Figure S3). These results indicate that the MD allele also affects early stages of tumor formation in the MMTV-PyVT model. In C3(1)-TAg, no significant difference in early lesions between MD+/+ and MD−/− at 6 months of age were found (Additional file 1: Figure S3), suggesting that the difference in latency in this model is mainly due to an effect on tumor progression. Taken together, the MD allele intervenes with tumorigenesis at multiple stages, but in a transgene-specific manner, namely most prominently in the MMTV-PyVT mouse model for human luminal breast cancer and MMTV-neu mouse model for human HER2+ luminal breast cancer, but less prominently in the C3(1)-TAg mouse model for human basal breast cancer. This is in accordance with the human genetic epidemiological data where the 8q24 breast cancer-associated variant is strongly associated with ER+/luminal breast cancer and weaker with ER−/basal breast cancer . As we had observed a difference in mammary fat pad weight, we asked if the tumorigenesis phenotypes were autonomous to the mammary epithelium or if non-autonomous (host/micro-environment) factors were involved. Using a reciprocal transplantation assay, four transplant groups were generated, namely MMTV-PyVT;MD+/+ into MD+/+, MMTV-PyVT;MD+/+ into MD−/−, MMTV-PyVT;MD−/− into MD+/+ and MMTV-PyVT;MD−/− into MD−/−. Tumor-free survival curves showed a strong increase in latency between the MMTV-PyVT;MD+/+ and MMTV-PyVT;MD−/− donor groups (Fig. 6a). This finding indicates a strong mammary cell-autonomous (donor) effect of the MD allele on tumorigenesis. The log-rank test did not indicate a difference in the distribution of times to first tumor between the recipient genotypes, which means that the effect of the deletion on MMTV-PyVT-induced tumorigenesis is strictly mammary cell-autonomous. While the effect of the MD allele on mammary tumor growth is autonomous, the effect on lung metastasis could show a recipient component. To determine this, lung macro-metastatic foci were quantified in recipients with palpable mammary tumors, small nodules and/or hyperplasia. Using two-way ANOVA analysis, we tested the null hypothesis that either donor and recipient genotypes or the interaction between donor and recipient have no effect on lung metastasis. We found that the donor x recipient interaction term was not significant (P = 0.28; Additional file 2: Table S2). The analysis suggests that there is a stronger donor effect (P = 0.07) than recipient effect (P = 0.49; Fig. 6b; Additional file 2: Table S2), suggesting that the difference in metastasis between MMTV-PyVT;MD+/+ and MMTV-PyVT;MD−/− mice likely has a mammary cell-autonomous component, but that a non-mammary cell-autonomous component cannot be completely ruled out. We measured the transcript levels of mouse-human conserved candidate causal genes, Myc, Fam84b, Pvt1, Trib1, and Fam49b. The non-conserved non-coding mouse transcripts (D030024E09Rik, EU234017, AK015045, 9930014A18Rik; Fig. 1) were not included in the analysis. Also not included was the non-conserved A1bg gene, as a poorly conserved human homolog is located on a different chromosome (chr19) in human and its expression cannot be detected in the mouse mammary gland. Myc transcript levels were reduced in MD−/− samples as compared with MD+/+ samples of all tissues examined, except the bladder (Fig. 7a). Most notably, Myc showed a reduction of approximately 40, 50 and 60% in the mammary gland, in MMTV-PyVT-induced and C3(1)-TAg-induced mammary tumors, respectively. Pvt1 transcript levels showed a non-significant reduction in the mammary gland and mammary tumor samples. Pvt1 in the prostate and thymus reached significance for a reduction of approximately 40%. In the colon, bladder and spleen, Pvt1 was not differentially expressed. Similar to Myc, Fam84b showed a reduction of transcript level in the mammary gland and mammary tumor samples. Fam84b reduction was also observed in the prostate, but not in the colon or bladder. In contrast to the other genes, the transcript level of Fam84b was increased in the MD−/− versus MD+/+ samples in thymus and spleen. 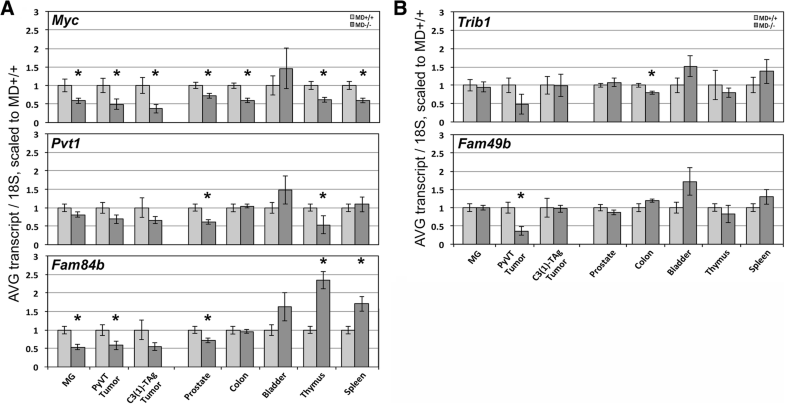 The transcript levels of Trib1 and Fam49b were mostly equal between MD+/+ and MD−/−, except for a reduction of Trib1 in the colon and a reduction of Fam49b in MMTV-PyVT-induced mammary tumors (Fig. 7b). The transcript levels of Actb were equal in all tissues measured (Additional file 1: Figure S4). We checked if downregulation of transgene expression level could underlie the anti-cancer phenotypes. The MMTV-PyVT;MD−/− tumor samples showed an increased transgene level compared with MMTV-PyVT;MD+/+ tumor samples. In the C3(1)-TAg tumor samples the transgene expression level showed a non-significant increase in the MD−/− versus the MD+/+ samples (Additional file 1: Figure S5). These results suggest that the MD allele does not result in an anti-cancer effect through downregulation of the transgene itself. Higher-order chromatin interactions connecting MYC to putative gene regulatory elements in the 8q24 gene desert have been identified in multiple studies [16, 37–39]. Using publically available global chromatin interaction data, generated through the Hi-C assay , we visualized the chromatin interaction heat map of the 8q24 gene desert locus along with the immediate neighboring genes for the human mammary epithelial cell line, HMEC (Additional file 1: Figure S5). The most prominent long-range interactions in the region involve MYC, including those previously found to bring the breast cancer-associated variants in proximity with MYC . We then used the 3C assay to survey putative interactions between the Myc promoter and the MD interval in the mouse mammary gland. We found multiple sites within the interval interacting with Myc over a genomic distance of ~ 250–450-Kb. The Myc-promoter chromatin interaction profile for the human HMEC cell line and the mouse mammary gland appeared to be evolutionary conserved (Additional file 1: Figure S5). We sought to investigate if mRNA expression levels of candidate genes MYC and FAM84B are associated with clinical outcomes in human breast cancer. The METABRIC and TCGA studies have generated comprehensive genomic portraits for invasive breast carcinomas [41, 42]. METABRIC is currently the most elaborate set with 2509 available cases, followed by TCGA that reported results for 1105 primary breast tumors. Querying the TCGA data through the cancer bioportal (http://www.cbioportal.org/) revealed that MYC and FAM84B are commonly amplified in multiple cancer types, including > 20% of all breast cancers (Fig. 8a). As METABRIC holds the most invasive breast cancer cases, we chose that data set for initial analysis. As expected, MYC and FAM84B are almost always co-amplified in the same breast tumors (Fig. 8b). However, examination of mRNA expression levels showed that FAM84B and MYC are only rarely overexpressed in the same breast tumor (Fig. 8c). Examination of clinical outcomes showed that FAM84B overexpression was associated with a significant decrease in breast cancer patient overall survival (104.3 months vs 159.7 months; P = 6.037 × 10− 6; Fig. 8d), whereas MYC overexpression was not significantly correlated with decreased survival with decreased survival (210.9 months vs 152.3 months; P = 504; Fig. 8e). The TCGA data set shows a highly similar pattern, namely FAM84B overexpression was associated with a significant decrease in breast cancer patient overall survival (83.8 months vs. 129.6 months; P = 0.01; Additional file 1: Figure S6), whereas MYC overexpression was not significantly correlated (114.06 months vs. 122.8 months; P = 0.266; Additional file 1: Figure S6). This same pattern is also observed at the 1.5 SD cut-off in the TCGA data (Additional file 1: Figure S7). FAM84B is more commonly overexpressed than MYC in breast cancer, namely 9% of samples versus 4% of samples at 2 standard deviations (SD) above the mean for the METABRIC data (Fig. 8c) and 23% versus 7% of samples for the TCGA data set (Additional file 1: Figure S6). We checked if MYC might be more commonly overexpressed at a lower threshold (1.5 SD above the mean), but that was not found (Additional file 1: Figure S7). Interestingly, disease-free survival was not affected by FAM84B overexpression (Additional file 1: Figure S7). These results suggest that FAM84B may not affect latency to recurrence of the disease, but results in faster disease progression once recurrent disease is present. The gene desert region proximal to MYC shows several key similarities between human and mouse, including similar organization of the genomic span, location of conserved genes (Myc, Fam84b, Pvt1), sequence conservation, and presence of putative gene regulatory elements. All non-coding transcripts and a coding gene (A1bg) located within the gene desert are not conserved between human and mouse. The A1bg gene is located distal to Fam84b in the mouse gene desert, but it aligns (by poor alignment scores) to a different human chromosome than the rest of the gene desert. In contrast to Myc, Fam84b, and Pvt1, A1bg is not detectable in mouse mammary gland samples and can therefore not be considered as a candidate. In this study we characterized a novel mouse deletion allele that models the strong association of the human 8q24 locus with breast cancer susceptibility. The deletion spans the mouse ortholog of the human gene desert region associated with breast cancer risk. Even though 430-Kb of sequence was removed, the deletion does not result in reduced fertility, viability or lactation. The profound anti-tumorigenic effect of the deletion manifests at early and late stages of mammary cancer development in three transgenic mouse breast cancer models. The results indicate that in the MMTV-PyVT model the MD allele causes a reduction in mammary neoplastic nodules at 4–5 weeks of age, a strong delay in mammary tumor formation, a reduction in tumor progression and lower amount of metastatic foci in the lungs. In the MMTV-neu model the MD allele results in a strong delay in tumor formation, with some MMTV-neu;MD−/− not showing a tumor at all at 72 wks of age, as well as a reduction in metastatic foci in the lungs. In the C3(1)-TAg model a strong effect on tumor growth is observed, but the effect on latency is modest. These anti-cancer effects may be mouse model or transgene-specific, potentially due to an interaction of the deletion-regulated genes with transgene-specific oncogenic processes. The deletion is unlikely to act through downregulating expression of the transgene itself as in both the MMTV-PyVT and C3(1)-TAg models, the MD−/− samples showed higher transgene expression than the MD+/+ tumor samples. These observations suggest that higher transgene levels in the transgene;MD−/− tumors are needed to be transformative. Notably, the strongest effects on early tumorigenesis and latency are observed in the MMTV-PyVT and MMTV-neu models for luminal breast cancer progression and metastasis. This result is in accordance with the human epidemiological data showing a stronger association of one of the 8q24 variants with ER+/luminal breast cancer than with TNBC . The transplantation assay indicated that despite an altered micro-environment (lower adiposity), the anti-cancer effects on tumor development elicited by the deletion allele are strictly intrinsic to the mammary cells. The transplantation assay was conducted essentially as described by Jackson et al. , but in contrast to our autonomous effect, their findings showed a non-autonomous effect of the genetic lesion on PyVT-induced mammary tumorigenesis, indicating that the assay can detect both autonomous and non-autonomous effects. We found the MD allele to be associated with a reduction of metastatic events in the MMTV-PyVT and MMTV-neu mouse models. The metastasis phenotype likely has a mammary cell-autonomous component in the MMTV-PyVT model, and may also have a non-mammary cell-autonomous component. There is ample evidence in the literature of micro-environment/host components affecting metastasis in the MMTV-PyVT model, most notably the involvement of T-cells, stroma, and macrophages [43–45]. We hypothesize that the non-coding deletion regulates gene expression in the mammary epithelium to control growth of the transformed cells arising in the mammary cancer-prone transgenic background. Our analysis revealed Myc and Fam84b as prominent candidate causal genes, as these were found to be differentially expressed between MD+/+ and MD−/− mammary gland and tumors samples, as well as various other tissue types. The proto-oncogene MYC encodes a transcription factor that together with its binding partner MAX is known to bind to E-box sequences to regulate gene expression involved in many cancer-related processes, including cell growth, proliferation, apoptosis, as well as general cellular processes, including transcription and translation . Therefore, MYC is widely regarded as a target for regulation by the 8q24 variants. Chromatin looping from the 8q24 cancer risk-associated region to the MYC gene and MYC allelic imbalance have previously been implicated in the breast cancer-modulatory mechanism underlying the 8q24 locus [16–18, 39, 46]. However, MYC expression levels have not been found to be associated with any of the risk alleles. Our study shows that deletion of the murine ortholog of the human breast cancer-associated region within the gene desert locus, located approximately 200-Kb proximal to the Myc gene, results in a measurable reduction of Myc transcript level in the mammary gland and tumors. In accordance with this finding and the previously discussed genomic similarities and sequence conservation between the 2 species, we found mouse-human-conserved chromatin looping from the Myc promoter to the region orthologous to the human breast cancer-associated 8q24 region, suggesting that this gene desert region in both human and mouse contains regulatory elements affecting Myc expression in the mammary gland. We found Fam84b to be downregulated to the same extent as Myc, suggesting that the deletion interval may contain regulatory elements for both Myc and Fam84b. FAM84B has also been identified to physically interact with the 8q24 gene desert locus through long-range chromatin looping, albeit in prostate cancer cells . Because such higher-order chromatin structures have not been found in breast cells, we cannot conclude that FAM84B is a direct target for regulation by the deletion interval and could also be a secondary target resulting from Myc downregulation. FAM84B has been implicated in breast cancer development, since it was found in a screen to identify proteins associated with the cell membrane in breast cancer and was further shown to associate with adherens junctions . The involvement of the lncRNA gene Pvt1 in 8q24-mediated breast cancer susceptibility has previously been suggested, although association of its expression level has been found to manifest with the risk allele of a breast cancer-associated SNP located within the Pvt locus , not within the 8q24 gene desert under study. We found a non-significant trend towards downregulation of Pvt1 in the mammary glands and tumors of MD−/− mice, suggesting that the deletion interval may also contain Pvt1 regulatory elements. Since, Pvt1 downregulation was weaker than Myc and Fam84b, we hypothesize that Pvt1 downregulation in the mammary gland is an indirect effect of Myc downregulation, as previously suggested . Outside of the mammary gland and tumors, we show tissue-specific regulatory effects of the deletion on transcript levels of the genes surrounding the locus. Most notably, Myc transcript levels were reduced in the MD−/− samples in all tissues analyzed, except for bladder, suggesting the presence of Myc-enhancer elements within the deleted interval that act in tissues relevant to the human cancer associations with variants in the 8q24 gene desert. Recently, Dave et al. published analysis of a 538-Kb deletion mouse model, lacking portion of our deletion interval, extending all the way to the Myc gene promoter . Our MD allele is different because we deleted a genomic region over 200-Kb away from the Myc gene. Even though the deletions overlap only partially, our findings are mostly in accordance with the findings by Dave et al. Both studies find that a large deletion of the gene desert regulatory region is well tolerated by the organism, as no deleterious effects have been noticed. We found a ~ 10% reduction in total body weight in the homozygous MD mice, which was not reported by Dave et al. Strikingly, in both studies a strong, tissue-specific downregulation of Myc was observed along with anti-cancer properties against Apcmin-induced polyp formation, carcinogen-induced mammary cancer , as well as transgene-induced luminal and basal mammary cancer (this study). No downregulation of Myc in the bladder was observed in both studies, and no effect on carcinogen-induced bladder cancer was found by Dave et al., suggesting that only in tissues with deletion-induced transcriptional silencing of Myc, tumorigenesis is disrupted. Given the striking overlap in phenotypes between the two deletion alleles, a genomic region controlling Myc regulation and anti-cancer properties can be assigned, namely the 333-Kb interval deleted in both mouse models (chr15:61445326–61,778,521 in mm10 built; Fig. 1). Dave et al. found that targeting individual conserved enhancer elements has limited effect on tumor development. Therefore, interrogating additional deletion mouse models genetically dissecting this gene desert further will result in a more detailed map of anti-cancer activity mediated by this locus. MYC amplification has been known as a frequent genetic alteration in breast cancer for several decades . Through the analysis of the TCGA data, it became clear that an increase in MYC activity and/or expression signature forms a subclass of TNBC (basal) breast cancer associated with poor outcome [49, 50]. We show here that, while the 8q24 amplicon is frequently observed in all breast cancers, an increased MYC transcript level is relatively uncommon and mostly occurring in the TNBC (basal) subtype. On the other hand, FAM84B transcript level increase occurs most frequently in the luminal and HER2+ subtypes and is associated with decreased overall survival in TCGA and METABRIC datasets, but not progression-free survival in TCGA (which is not available for METABRIC). These observations suggest that FAM84B has cancer-promoting properties contributing to poor outcome after recurrence, and that MYC is not the only oncogene located in this frequently amplified genomic region, supporting a role for the nearby FAM84B gene as a novel potential driver oncogene in human breast cancer. Myc and Fam84b may contribute synergistically and/or independently to the observed mammary cancer reduction phenotypes in the MD mouse model. This analysis will form the basis for additional mouse genetic model approaches in which more specific non-protein coding gene regulatory elements associated with breast cancer risk could be assessed for their effect on Myc and Fam84b regulation and breast cancer development. Other future work will be focused on deciphering the relationship between Myc and Fam84b overexpression in the development of specific breast cancer subtypes. Breast cancer risk variants identified by GWAS are mostly located to non-protein coding genomic regions. The gene desert on human chromosomal band 8q24 is a prototype example of a breast cancer-associated non-coding region. The cancer risk-associated interval contains multiple previously identified enhancer elements regulating nearby genes, most notably the proto-oncogene MYC. Upon deletion of the sequence in the mouse genome orthologous to the 8q24 gene desert region associated with breast cancer risk, we found that the deletion is well tolerated, as no deleterious effects were found in homozygous MD mice. The MD allele in homozygous state has anti-cancer effects in 3 transgenic mouse models for breast cancer. The results from a reciprocal transplantation assay suggest that the anti-cancer effects are initiated through activity of the deletion in cells of the mammary epithelium. We further show that deletion of the gene desert interval results in lower expression level of Myc and Fam84b, which are genes located adjacent to the gene desert, but over 200-Kb and 500-Kb away from the deletion interval, respectively. The expression study highlights these genes as strong candidates to be mediating the anti-cancer properties exhibited by the deletion. Our analysis of the METABRIC and TCGA datasets support the hypothesis that in human breast cancer, amplification and overexpression of MYC or FAM84B specifically contributes to development of the basal or luminal subtype, respectively. Collin Homer-Bouthiette and Yang Zhao contributed equally to this work. The authors thank Christopher Attaway for help with the breeding colony. The authors thank Dr. Jeffrey Rosen, Dr. Suzanne Fuqua, Dr. Adrian Lee, Dr. Kent Osborne, Dr. Dennis Watson and Dr. Steven Rosenzweig for discussion over the course of the MUSC-Baylor BRIDGE project. The work was supported by the US Department of Defense (W81XWH-11-2-0222 to BMGS). Funds from the Carbone Comprehensive Cancer Center at UW-Madison (to MNG), the Center for Genomic Medicine and the Department of Pathology and Laboratory Medicine at MUSC (to BMGS). The work was also supported by generous donations from the James Island Youth Soccer Club (James Island, SC), Parent of Stiles Point Elementary School (James Island, SC) and the Liberty Twp fire fighters (Liberty, OH). Conception and design, BMGS, MNG; development of methods, BMGS, JDH, MNG, MCJ, PAP, SPE; data collection, CHB, YZ, LBS, BVP, RCB, JDH, BMGS; data analysis and interpretation, CHB, YZ, EGM, RCB, AIR, STG, SPE; writing of the manuscript: CHB, YZ, BMGS; study supervision: BMGS. All authors read and approved the final manuscript. All mice were maintained in AAALAC-approved facilities at UW-Madison and MUSC. All experiments were performed under adherence to ‘The Guide for the Care and Use of Laboratory Animals’. The protocol was approved by the Institutional Animal Care and Use Committee of the University of Wisconsin-Madison and of the Medical University of South Carolina.